This article aims to provide the basic knowledge of how to recognize snacks by using Python and SimpleCV. Readers will gain practical programming knowledge via experimentation with the Python scripts included in the Snack Classifier open source project. To illustrate with a snacks recognition app, the Snack Watcher watches any snacks present on the snack table. For Snack Watcher to determine if there was an interesting event, it needs to process the image into a set of image “Blobs”. For each “Blob”, Snack Watcher compares the “Blob” with it’s previous state to determine if the “Blob” was added, removed or stationary. More interestingly, the Snack Watcher can be configured to recognize if that “Blob” looks like a particular kind of snack (e.g. cookie or candy). 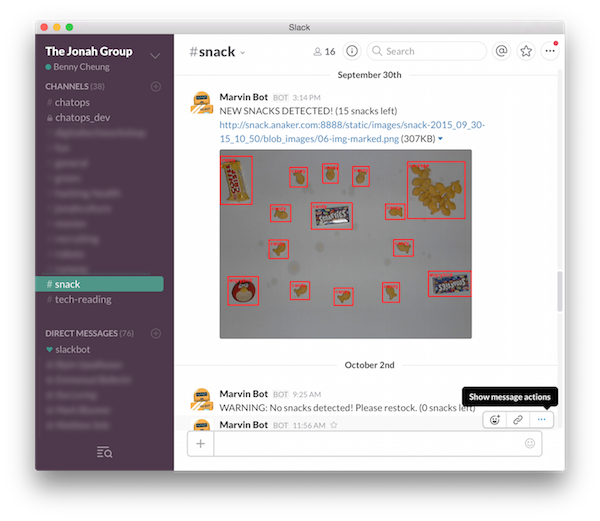 In the following Snack Watcher captured image, we can see the snacks have been classified and the results are labelled with their kind, reporting the “NEW SNACKS DETECTED!” event onto a message channel. 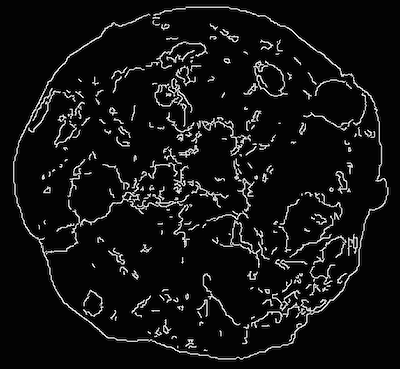 The Python computer vision’s framework, SimpleCV is an OpenCV wrapper, that makes processing, detecting, and displaying image simple, so that we don’t need to invest great effort to achieve interesting results. For machine learning and data classification, SimpleCV is built on top of the Orange framework. Orange implements a rich set of image extraction operators and machine learning algorithms to support our goal - the snack classification. For setting up OpenCV, SimpleCV and Orange for a Raspberry Pi project, please refer to this blog post Raspberry Pi 3 for Computer Vision for instructions. The best way to learn about snack classification is trying it out. The Snack Classifier is an open source project for snack classification. It comes with two Python scripts to help experiment with the system. Once the concepts are affirmed after experimenting with the scripts, the Snack Classifier can be used as a Microservice to support your snack classification tasks; extending the overall goal of effective snack watching! The Python scripts described in here can be used as a Supervised Machine Learning tools. The typical supervised machine learning will go through two stages (see picture below). During the first stage (a) Training, the computer is presented with example inputs and their desired outputs label (aka. class, such as cookies), running through a set of feature extractors to summarize the input as a vector of features. With the support of the SimpleCV machine learning algorithms, the system generates a classifier model which can effectively classify the training inputs. The second stage (b) Prediction, can take a unknown input sample, running through the same set of feature extractors to summarize the unknown as a vector of features. With the classifier model obtained from training, the unknown input can be classified as the result label (e.g. cookies). This script has been inspired by this article, A fruit image classifier with Python and SimpleCV. We have enhanced the article’s code snippet to make an easy to use Snack Training and Classifier scripts. The default path containing all the training images is train, the default path containing all the testing images is test and the default path where the results are written is result. Of course, you can change the directories with the corresponding commandline options. 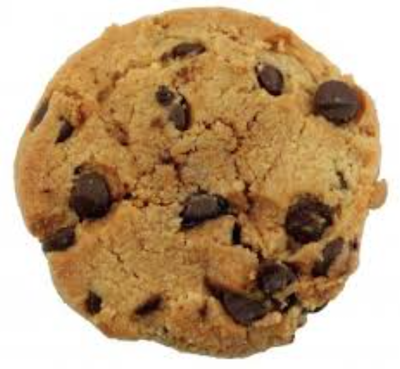 In this example, we are classifying cookie and other. We specify to use tree classifier to classify the test images. The result annotated images will be saved into result. In addition, the trained classifier parameters are saved into, default by the classifier name, e.g. tree.dat. We can use this classifier file for further image classification by executing snack-classify.py after training. If we are using tree classifier for training, the default trained classifier will be saved as tree.dat (Note: the snack-trainer.py has an option to control the classifier saved filename if needed). Subsequently, we can use tree.dat to reconstruct the classifier for classifying other images. 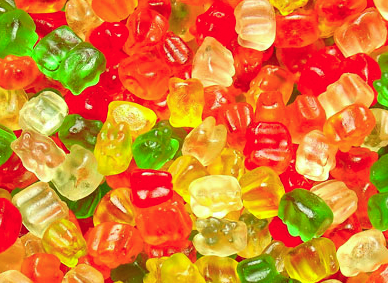 snack-classfy.py is the utility program to perform further image classifications. It would reply the classified name for the given image. To deepen our practical knowledge of image training and classification, this section is aimed to show a series of Python code snippets. It is not meant to give an exhaustive tutorial of the SimpleCV machine learning packages here, instead you can obtain the full detail in SimpleCV Documentation. This illustrates how to use SimpleCV machine learning packages within the context of training and classifying snacks. It demonstrates the practical usage of the SimpleCV methods; we can learn how the Snack Classifier’s Microservice was built. 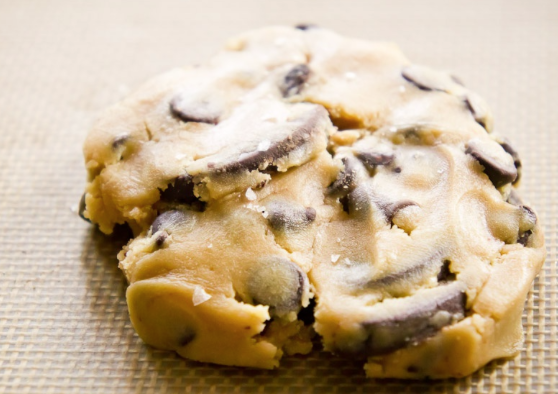 For the code snippets, we are referring to this sample Cookie Image, download it and work along with the following code snippets. In this section, we are playing with SimpleCV Feature Package. This extractor method takes in an image, applies an edge detector, and calculates the length and direction of lines in the image. The value of the lines are accumulated into bins and formed a 1D edge length histogram and 1D edge angle histogram. For example, we would like to do the edge histogram feature extraction from cookie_001.png image. The features are slotted into e.g. 5 bins. Then, we print out the feature field names and their values. When you inspect the statistical results of the edge extraction, the results make intuitive sense that the small segments are dominating over the long segments. The edge’s angles produce a normal distribution of the angular values. This feature extractor takes in an image, gets the hue channel, bins the number of pixels with a particular hue values. The hue values are accumulated into bins and formed a 1D hue histogram. For example, we would like to do the hue histogram feature extraction from cookie_001.png image. The features are slotted into e.g. 5 bins. Then, we print out the feature field names and their values. The result says the “reddish” colour dominating this sample cookie image. For example, we will use SimpleCV’s haar.txt file for defining the set of Haar-like features extraction parameters. Then, we print out the feature field names and their values. Since extractor produces a lot of features, the result has been clipped for displaying in here. In this section, we will explore the SimpleCV Machine Learning Package. We are describing four classifiers, SVM, Tree, Navie Bayes and KNN in this section. With the extractors and classifiers accumulated up to this point, we are ready to incorporate this knowledge into a full image extraction and classification example. We obtained the classifiers by constructing them with a set of extractors. To break the code snippet down a little more, we have created a set of extractors, namely hue, edge and haar extractors. These extractors are capable of taking an image and extracting the essential features from it. The hue extractor will notice the pixels’ hue and slot the values into bins. Similar, edge and haar extractors will perform their special calculation for an image. Mathematically, these extractors have vectorized image characteristics into a set of feature values. A feature, such as hue of red, could be characterized by value of 0.018 in field name of Hue0 for example. We can think of feature vector as a kind of formal description for an image. Every image from our training set will be characterized as a feature vector. 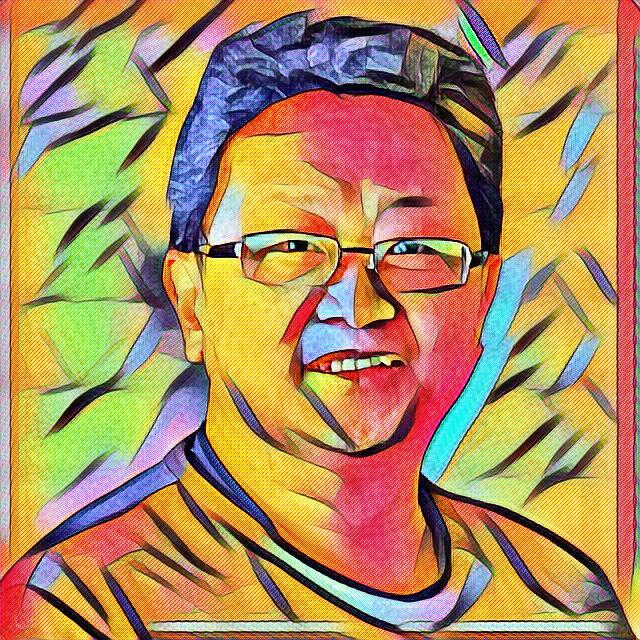 We have read the image cookie_001.png, and use hue extractor (in the example code, extractors, to extract the hue feature vector with their binned values. The code is written to list 8 random features fields and values for illustration. 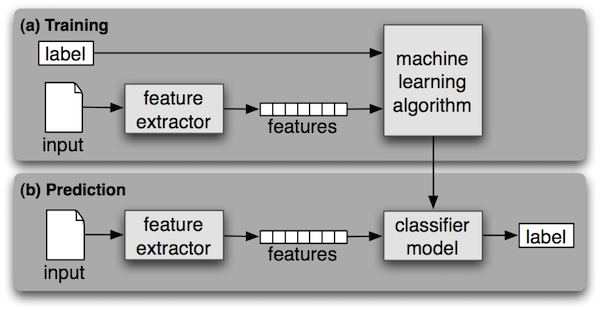 The classifier will use the extractors, obtaining the feature vector, to train itself to produce a classifier model. Now that we have done the classifier training, we can save the classifier model into a file. For example, we have saved the tree classifier into tree.dat. 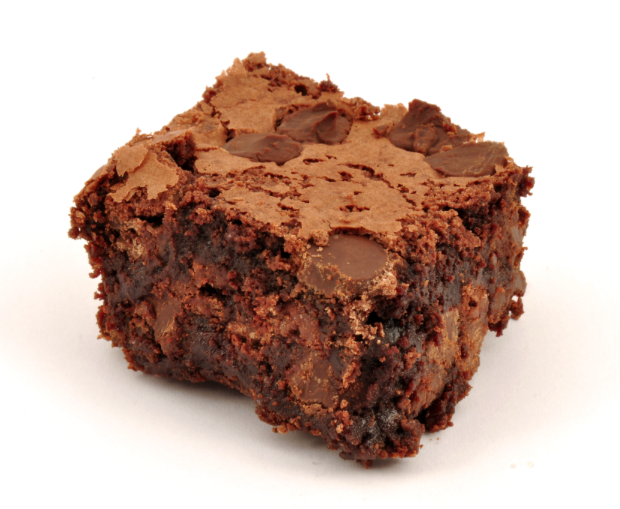 Our example tree classifier has been trained with the labels of [brownie, candy, cookie, other]. After importing, we can use the classifier model to classify our unknown images. The result will tell us what they are. Go ahead, you’re ready to configure the Snack Watcher to learn and classify some snacks!